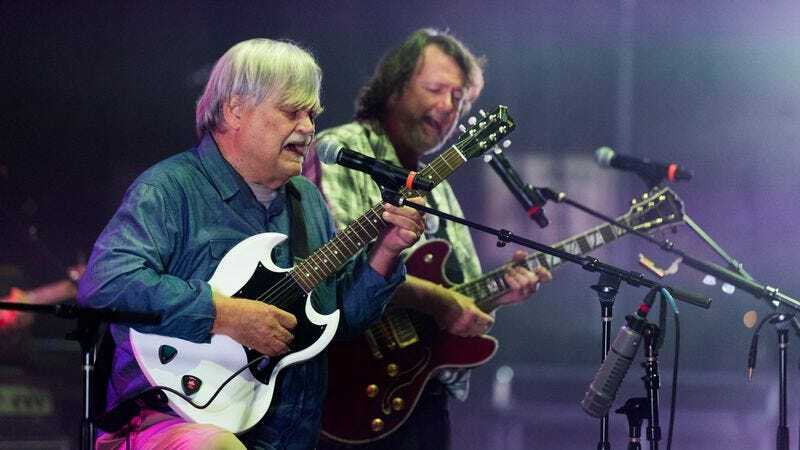 As reported by Variety, “godfather of the jam band scene” Colonel Bruce Hampton died after he suffered a fatal heart attack while on stage at a concert in Atlanta celebrating his 70th birthday. He reportedly collapsed while he and other musicians were playing “Turn On Your Lovelight,” but he was on the ground for several minutes before people realized he wasn’t joking and took him offstage to get medical attention. He later died at a nearby hospital. Hampton turned 70 on April 30. Hampton, who was born Gustav Valentin Berglund III, was a founding member of Atlanta’s Hampton Grease Band, which began as a blues rock act in the ‘60s and later adopted a wacky, surrealist stage presence that brought them to the attention of bands like the Grateful Dead and the Allman Brothers. The band released one album, Music To Eat, before Hampton split off to start a successful solo career. He later formed experimental rock band Aquarium Rescue Unit in the early ‘90s, which toured with other big names from the jam scene like Blues Traveler, Phish, Widespread Panic, and the Spin Doctors. Over the next few years, Hampton continued releasing albums and starting bands, including Fiji Mariners and Codetalkers. His last solo album, Pharaoh’s Kitchen, was released in 2014.